Squash that! Oh wait… that’s the design? Sometimes I wonder if the Citizens Coinage Advisory Committee and U.S. Commission of Fine Arts is actually paying attentiong to the designs they are selecting. While they have rejected some interesting designs, they seem to accept other designs without really thinking. 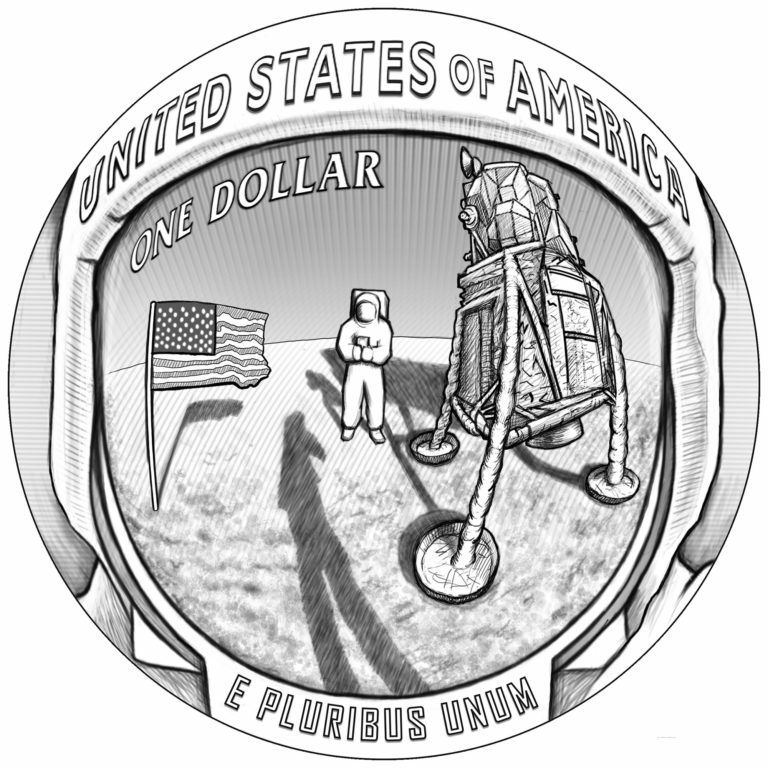 It looks like these two groups that are supposed to be the gatekeepers of the design of U.S. coinage did not fully think through their design selection for the Apollo 11 Commemorative Coin program. When the line art images were sent out, the design did not immediately remind me of a bootprint on the surface of the moon. Actually, it reminded me of something that many of us have placed our bootprint on a little closer to the ground. I understand that with the resignation of Kareem Abdul-Jabbar from the CCAC that this august body may be lacking the appropriate point of reference that Abdul-Jabbar and I have to make the tie between the bootprint and an insect that could probably survive on the moon (he was born Lew Alcindor in New York City). Then again, the CCAC is the same organization, albeit, with different members, that gave us some of the worst designs in modern coinage. For the 50th anniversary of one of the greatest achievements of the 20th century, all the CCAC could come up with is a bootprint? Dubia Roach image courtesy of Reptile Supply Co.
For the last few months, the Commission of Fine Arts and the Citizens Coinage Advisory Committee have been volleying between each other and the sculptor-engravers at the US Mint over the design of the reverse for the 2010 Lincoln Cent. Based on what is being reported one thing is clear, the designs are somewhat less than stellar. While the mandate sounds simple, there is a catch: Lincoln only caught a glimpse of a united country. Prior to Gen. Robert E. Lee’s surrender on April 9, 1865, Lincoln visited Richmond after it was taken by Union troops. Lincoln was greeted as a conquering hero by newly freed slaves on his way to visit the Confederate capital. When Lincoln arrived at Jefferson Davis’s office, he sat behind Davis’s desk to symbolize that there was only one president who had the authority to rule over the land. Lincoln was assassinated on April 14, 1865 and died on April 15. With that rich and well documented history, someone could not come up with a good theme to represent the preservation of a united country? Even though the Confederate states did not participate in the 1864 election, Lincoln’s re-election and inaugural speech laid claim to his desire to end this bloody chapter in our history and pursue a policy of peace. What would be a better iconic image than Lincoln delivering his Second Inaugural Address. Although there is only one known photograph of the inauguration (see above), there are artists renderings that could be used to base a design. For example, the color image to the right of this paragraph was found on the Internet. I do not know who created the image but it shows Lincoln standing at a lectern with Vice President Andrew Johnson (a southern Democrat) sitting behind Lincoln, and Chief Justice Salmon P. Chase standing to Lincoln’s left. It is a better image to use than what appeared on the cover of Harper’s Weekly because it shows a more dignified proceedings’plus I think it would look better on a small coin, like the cent. I think that this is a better idea than sheaths of wheat, shields, and images of the Capital building because it is clearly about Lincoln and how he lead the nation out of its bloodiest war into one United States. If you agree with me, I encourage you to contact the US Mint, CFA, and CCAC to let them know if this idea. After all, it is our money, we should have more of a say in how it looks!! Similar designs were used throughout the Soviet bloc countries during the Cold War era. Aside from being US Mint policy not to use desings that have appeared on foreign coins, the imagry of using socialist and communist symbols of the past makes the design a bad idea. I have learned that the Citizens Coinage Advisory Committee selected the shield design LP-13 (see the image). The design entitled “Shield of Union” resembles the pattern cent designed by William Barber. However, the CCAC did express their concern that the designs submitted were not as good as they could be. Next month, the CCAC will look at new designs for the obverse of the 2010 Lincoln Cent. While I am not in favor of changing the Victor David Brenner design, I learned that the CCAC will be looking at keeping the portrait but making it larger on the planchet. Hopefully that is the only design change they make. If you are in the Washington, DC area on April 16, the U.S. Commission of Fine Arts will be holding a public meeting. The CFA will meet at the National Building Museum located at 401 F Street NW in Suite 312. Meeting is scheduled to convene at 10:00 AM. On the agenda is the selection of the final design for the 2010 Native American One Dollar Coin. Five reverse designs are being considered. The CFA is also considering the final design for the permanent reverse for the 2010 Lincoln Cent. Sixteen designs are being considered. Based on what I have read in previous minutes of the CFA’s discussions, it could be entertaining to hear what is said about these coin designs. Anyone interested in attending the U.S. Commission of Fine Arts (CFA) meeting on February 19, 2009, can attend the 10:00 AM meeting at the National Building Museum, Suite 312, 401 F Street, NW., Washington, DC 20001-2728. CFA meetings are open to the public, but the public does not participate in the discussions. The CFA is part of the sausage making process coin and medal designs must go through before they are struck. On the agenda for this meeting are the final design decisions on the Congressional Gold Medals for Edward William Brooke III and Daw Aung San Suu Kyi. Design decisions will be for a gold medal and bronze duplicates. Simcha Kuritzky, Treasurer of the Montgomery County Coin Club and past president of the Maryland State Numismatic Association, attended the June 18, 2008 meeting of the Citizen Coinage Advisory Committee. The agenda was to review the possible reverses for the Native American $1 Coins. Simcha reported that for the 2009 reverse, the CCAC chose the design representing the three sisters: maize, beans, and squash, which are grown together. As required by law (Public Law 110-82 [PDF]), the date will be removed from the obverse and placed on the edge so that all circulating dollar coins will have edge lettering. There were three reverses that had substantial support: a woman planting seeds with three corn plants in the background; three woman’s faces with the respective plants intertwined in their hair; and three sets of plants with a shining sun. The first and last designs had the most support from Native American groups. The main arguments at the meeting were over the novelty of design: the three faces design was a fresh approach and some members wanted greater artistic vision, while others were concerned that most people wouldn’t understand the design. The woman planting design had support because it showed agriculture (as opposed to nature) and women’s roles in the native economy, but the plants were small and may not show up well on the actual coin. The designs and CCAC recommendation will be submitted to the U.S. Commission of Fine Arts for their opinion. The Director of the US Mint as proxy for the Secretary of the Treasury will make the final decision. Today, I noticed that the US Commission of Fine Arts posted the final minutes from their April 17, 2008 meeting. The CFA is part of the coin design bureaucracy that is required to approve, reject, or recommend changes to coin designs. These minutes approve of the 2009 Double Eagle gold coin US Mint Director Edmund Moy proposed the design to the Citizens Coin Advisory Committee. Confirmation of recommendation on the 2009 Double Eagle Gold $20 ultra-high relief coin based on 1907/08 design by Augustus Saint-Gaudens. Mr. [Thomas E.] Luebke [Secretary] said that the proposal had been circulated to the Commission members for a vote prior to the Commission meeting due to the U.S. Mint&rsqou;s tight production schedule and the similarity of the proposal to a historic coin design; he asked the Commission to confirm the recommendation. He said that the Mint’s proposal was to reissue a coin from 1907 designed by Augustus Saint-Gaudens: the original high-relief design was minted for one year, then adapted by the Mint to a low-relief coin that was issued from 1908 to 1932. The only proposed changes to the 1907 design would be to update the minting year, which will continue to be rendered in Roman numerals; to add a rim which will improve the production process; and to add the phrase “In God We Trust” which was historically included on the coin from 1908 onward. Upon a motion by Mr. [Earl A.] Powell [Chairman] with second by Ms. [Dianna] Balmori, the Commission confirmed its recommendation to approve the updated design with the comment that the Roman numerals for the issue date be as similar as possible to the original design in scale, spacing, and character. As for the necessary legislation to allow the Mint the produce these coins, H.R. 5614 passed the House of Representatives on May 15 with a unanimous vote. The Senate’s version, S. 2924, is still in committee. Want to Design the Next COTY? The US Mint has announced that they are seeking applicants for two openings to the Citizens Coinage Advisory Committee (CCAC). The CCAC advises the Secretary of the Treasury and the Director of the US Mint as to the design of numismatic products produced by the US Mint. CCAC’s recommendations are submitted to the US Commission of Fine Arts (CFA) for final decision. In this announcement, four year appointments are for the representative specially qualified in numismatics and one from the general public. Interested parties should send a cover letter, a resumé or curriculum vitae outlining relevant experience, and an indication of which position is being applied for to the US Mint by fax to 202-756-6525, or by mail to the United States Mint, 801 9th Street NW, Washington, DC 20220, Attn: Greg Weinman. Applications must be postmarked no later than January 31, 2008.